Detox Wall: The Wall that Detoxifies | gURROO - A new generation of innovative minds. Project Location: Alexandria Egypt, King Mariott Lake. Factories around the lake dispose their artificial color waste into the lake every day. This degrades the quality of the water, making it impossible for farmers in the agricultural areas around the lake to utilize it for irrigation purposes. It also endangers the marine life, causing the lake to be stagnant and murky. 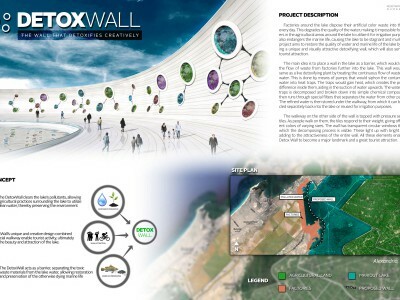 This project aims to restore the quality of water and marine life of the lake by building a unique and visually attractive detoxifying wall, which will also serve as a tourist attraction. 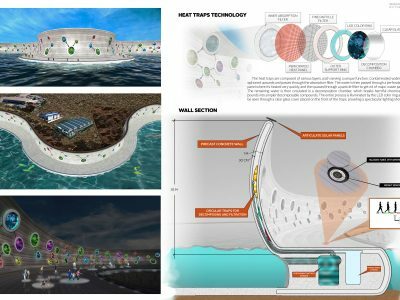 The main idea is to place a wall in the lake as a barrier, which would restrict the flow of waste from factories further into the lake. 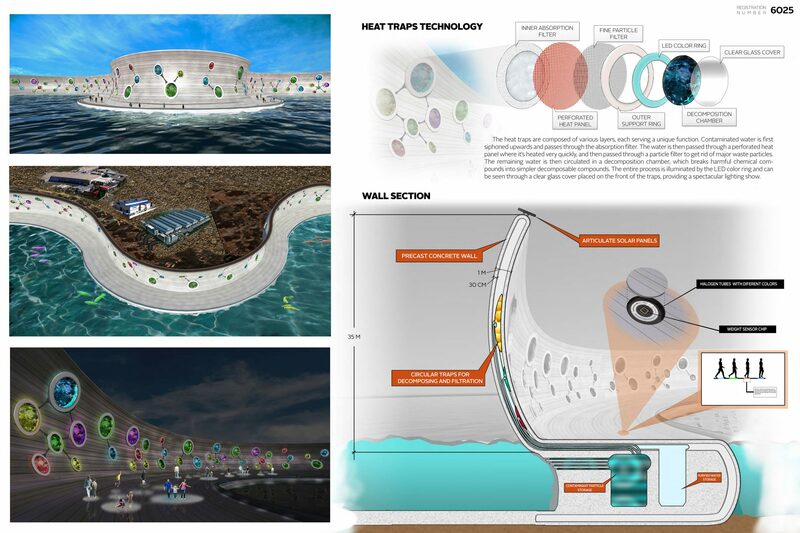 This wall would also serve as a live detoxifying plant by treating the continuous flow of waste in the water. This is done by means of pumps that would siphon the contaminated water into heat traps. The traps would gain heat, which creates the pressure difference inside them, aiding in the suction of water upwards. The water in the traps is decomposed and broken down into simple chemical compounds. It then runs through special filters that separates the water from other particles. The refined water is then stored under the walkway, from which it can be recycled separately back into the lake or reused for irrigation purposes. The walkway on the other side of the wall is topped with pressure sensitive tiles. As people walk on them, the tiles respond to their weight, giving off different colors of varying sizes. The wall has transparent circular windows through which the decomposing process is visible. These light up with bright colors, adding to the attractiveness of the entire wall. 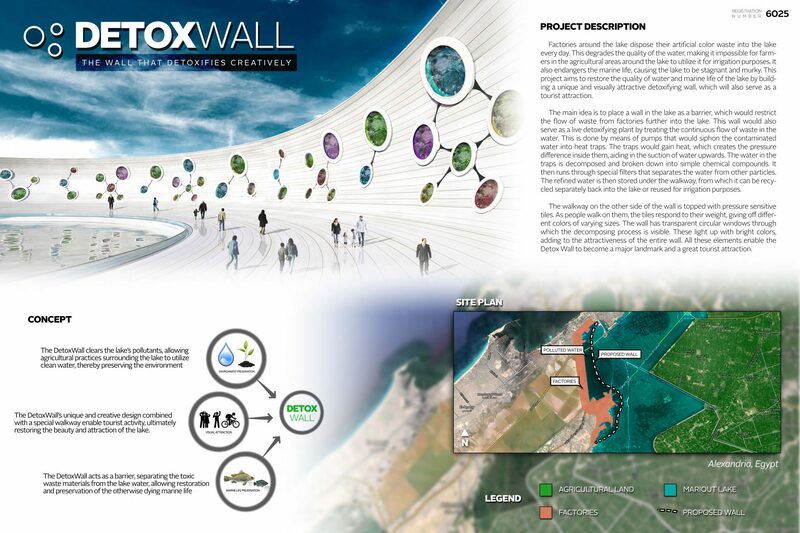 All these elements enable the Detox Wall to become a major landmark and a great tourist attraction.